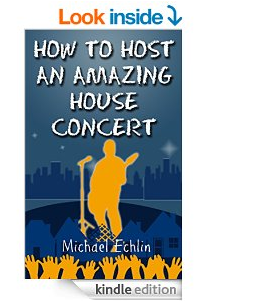 New eBook: How To Host An Amazing House Concert | M.E. Very excited to announce a guide I’ve been planning/writing for some time is available today on Amazon! There’s an insurgence of indie musicians taking to living rooms, backyards, decks, farms and winning new fans. House concerts are not a new concept but they are taking center stage as artists are using new tools such as crowdfunding to plan these unique gigs. I’ve talked to many people about hosting these shows and some feel reluctant not knowing how much effort is involved. House concerts can be public or private and I layout a full plan of attack in the ebook.